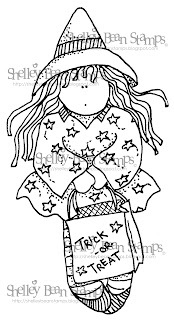 If you are looking for the ALL THINGS ALTERED/FALL BLOG HOP...Please click here: If you would like to proceed on to the Once Upon a Halloweenie Hop...then keep reading. Hello and Happy Friday! 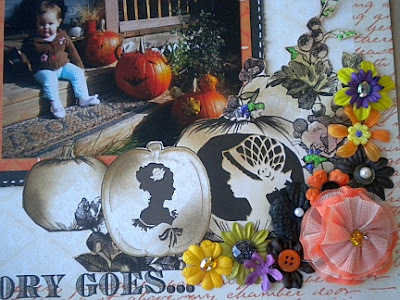 Welcome to the Once Upon A Halloween Blog Hop sponsored by Paper Patch Crafts Online Store. We are so happy you are joining us for the fun release of the Webster's Pages Once Upon a Halloween Line. They are so cute! I have had such a blast working with them. 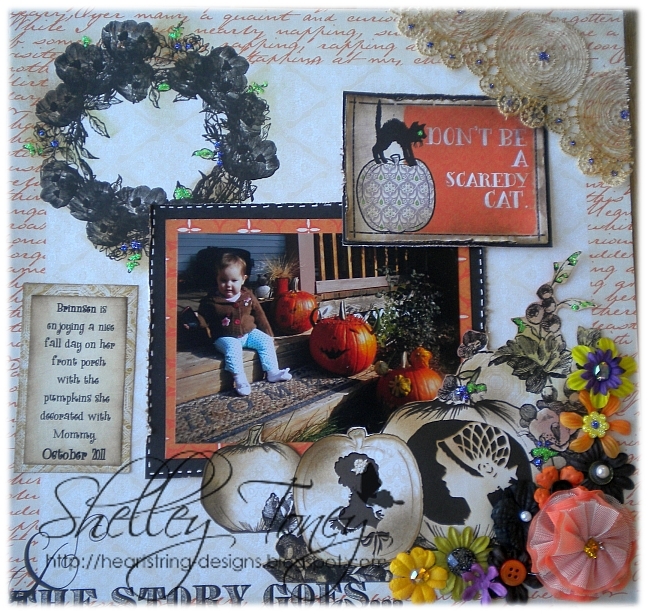 You probably found my blog today by hopping over from Shelley P's blog at Scrapbooking for Fun. And, if you came upon this hop by lucky chance you can hop on back there to start at the very beginning. Unlike many hops, this one is very short and sweet. You will only need to visit 4 blogs to complete it, and there are prizes to be won just for participating. Close up details. I did some fussy cutting of the pumpkins and vines. I also used distress inks to add some color. The Lace is so pretty. Here is a little corner embellishment I made with this beautiful Natural Circles Lace Trim. I added some stickles and distressed it a little with ink to give it a more aged look. I also created a couple fun cards!! Not every frightening thing is so obvious. My bathroom scales terrify me! I decided to play off that idea using an acrylic overlay along with the cute paper. The Stamp is from Mo Manning. Just to take it one step further I created these fun little folder tabbed photo and journaling mats to fit inside the card. This would make a fun gift or invitation idea. I have a fun giveaway for you today just for visiting my blog. 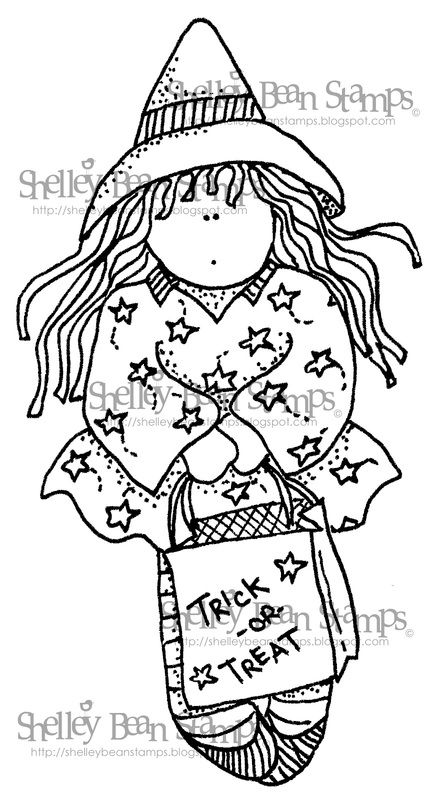 I create rubber and digi stamps over at Shelley Bean Stamps, and I am going to give away this adorable digi for your Halloween fun. To receive the digi, become a follower and leave me a comment on this post along with your email address. You MUST provide your email address in order to receive the digi. If there is no email address....then I won't know where to send it to you. 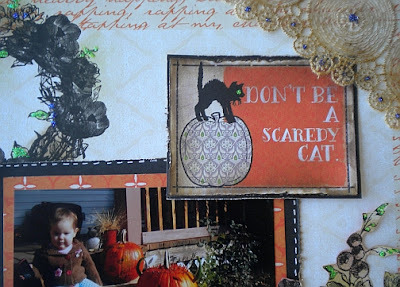 Please Hop on over to Joanne's Blog at Using Up the Pretty Paper to proceed on this hop. If you get lost...here is the line-up! Be sure to hop all the way through for more surprises!! Gorgeous Halloween page! LOVE the fussy cutting!!! Haha, I love the clever idea of the scale being more frightening! SO fun! What a cute little girl you have!! Love the scary scale, so true! All of these projects are simply stunning!! And I lOVE the pictures of your little one! Your layout is really lovely! You have so much to look at......and that saying is way tooo cute....TFS, and yes, I'm following you on Pinterest!!! Love the inked paper pieces and lace. wow Shelley fantastic projects. 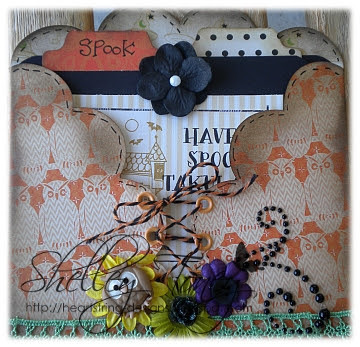 I'm not sure which one is my favorite, its a tie between the beautiful fall layout and your corset card. Great layout and cards! Love the bathroom scale one... how very true! I have the same fear! OH my, you have a stunning layout. I just love all the wonderful elements that you have included in your layout. Especially the ones in the bottom right hand corner. I had to chuckle when I looked at your card. I love the lady on the scale. Beautiful projects. Love it all.. Wonderful projects especially like the corset card :) TFS!!! Beautiful LO and nice cards. I like the close up shot of the flowers. I like to see what and how they are used. You do not have to enter me in the drawing. Fabulous layout!!! Super cute digi too... dotssecret at yahoo dot com...thanks! Wow, your layout is just full of surprises! The more I look, the more I see! 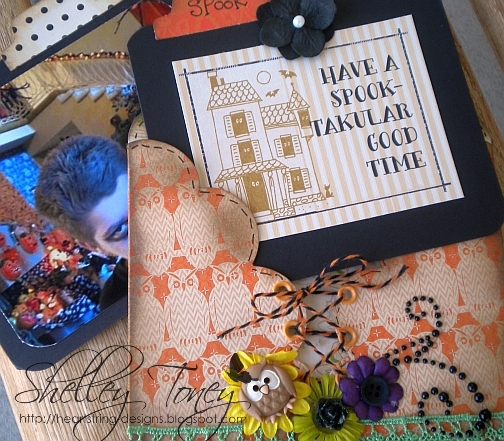 I just love Halloween and these projects are getting me in the mood! Thanks for the darling digi! You really did some fantastic work here! Love the fussy cutting on the layout, the scale card is too funny, and that corset...so creative!!!! Love your blog too!